By the time you read this, I might be wondering the streets of Old Town in Prague, admiring art in the museums of Vienna, or bathing in the spas of Budapest… checking cities off my List. Not pictured: my iPhone which I was using to take the photo, my passport, flight/travel papers, wallet, and underwear for privacy, and the pair of shoes and socks I’ll be wearing. 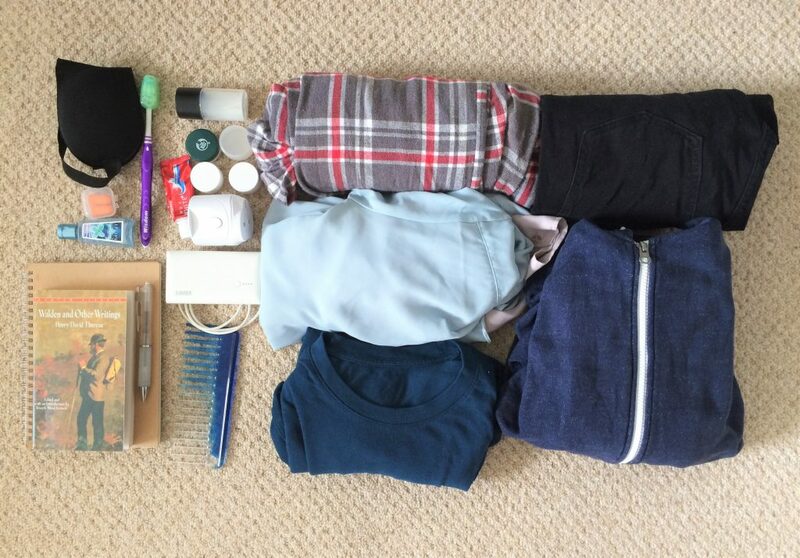 Too many toiletries/makeup—I’m not planning to look/smell homeless, but as a tourist I doubt people will pay too much attention to what I look like. Also, coconut oil is a great multi-purpose skin moisturiser, lip balm, hair conditioner etc. which saves me having to take too many travel bottles. Extra clothes—I would rather pay a few Euros for laundry/drying than carry too much around with me since I plan to do a lot of walking. Gadgets/valuables—apart from my phone which I’ll be using for directions etc. I won’t be taking any other gadgets (including DSLR, see below), my watch, or jewellery or valuables that can get stolen. A towel/hairdryer etc—too bulky, I’ll be staying in a mix of hostels and Airbnb which provide them. I’ll fly with just carry on, so everything will fit in a medium sized backpack (about the size that would fit a 15 inch laptop) that weighs 6-8kg. Even though I’ll be taking very little for the trip, I’m not worried—I’ll mostly be in big cities so if I really need something, I can just buy it. In a new exercise in mindfulness, I am deliberately not taking my DSLR so that I will spend my energy enjoying the sights in real life (gasp), rather than photographing them. If I like how something looks, instead of taking a photo and rushing off, I intend to spend an extra few minutes appreciating it in person. I might even sketch it into my notebook (I’ve been inspired lately by Leonardo da Vinci to write/draw more things down). I could have packed more, or I could have packed less. Everyone is different, and everyone needs and likes to have different things. From my previous travels, I’ve learned what works for me and what I’m comfortable with. Have I forgotten anything? Let me know what you think! In the meantime, check out the latest posts on Minimalist Meditations on Equanimity and on Expectations. This entry was posted in Minimalism, Travel on August 26 2017 by Jessica.